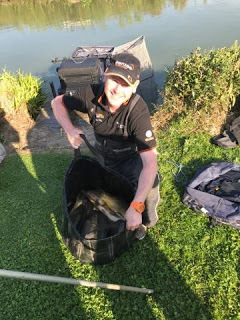 When I booked in, Pete said we’d be on Longs today which I was looking forward to it as it’s been fishing really well with Roger Russell winning Fridays silvers match with over 28lb of skimmers from peg 33. I stopped off on the way and had breakfast at the Little Chef, which as always was good although a tad expensive. The traffic wasn’t too bad and I arrived in good time and it was already looking like being another scorching day. There were only a few cars there and the first person I saw was Roger and we were having a chat when I noticed the Tart who’d been for a walk round the pond and my heart sunk! I asked how he’d got on yesterday and he said he’d blown out although he had that smug look about him but as that’s normal, I thought no more about it! After collecting some nets and paying my pools I was having a coffee and waiting for the draw when Pete said he had a special announcement and presented the Tart with an envelope containing his winnings from yesterday, yep that’s why he’s called the Tart! On the Bank Holiday matches, Pete splits the payout down the middle and today he would be paying the top two in carp and the same in silvers. It was also draw and choose so Pete got Simon R to pick out a ball to determine which number the golden peg would be today, he pulled out number one and Pete commented that very often the same number comes straight back out. With all the balls back in the bucket, Pete stuck his hand in and mixed them all up before offering the bucket to Simon again and blow me if he didn’t pull out number one again! I ended with choice number five and of course the Tart pulled out his usual flier with choice number two. 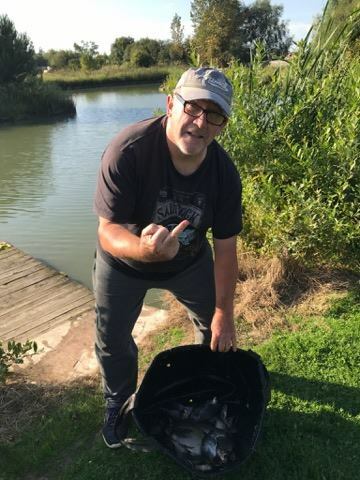 Simon wanted a carp peg and went for 15, the Tart chose 37 and would also fish for carp, we decided to have the side bet on our respective positions for carp and silvers. 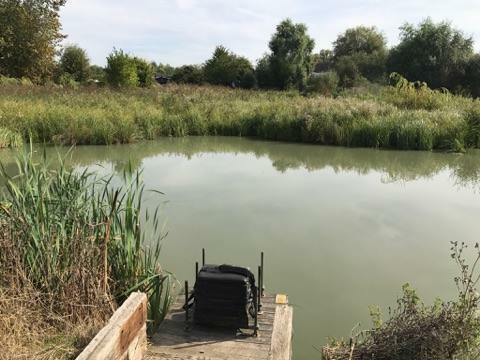 Glen also went for a carp peg, number 39, Rob Birch went for peg 19 and would be targeting silvers and then it was my turn, I couldn’t believe 33 hadn’t gone yet as it was my first choice, so that’s what I went for. Roger picked 35, Jeff Sparkes went for 17 and Mark Leahy opted for 23. My peg looked nice and from reading Rogers report on Friday’s match on Facebook, I knew he’d caught his fish on top two or top two plus one to the reeds on the left and straight out on worm or paste. Most the silvers seem to be getting caught fishing short so I set up a 0.3 gram NG Mini Gimp to fish top two either side and also plus one straight out. I also couldn’t resist setting up a 0.4 gram Malman Pencil for two lines at ten metres. As always my side tray was nice and simple, Bait-Tech 2mm Carp and Coarse micros that I’d soaked the night before plus 4mm Xpands for the hook. On the whistle I fed modest amounts of micros on all three of my shorter lines and then half a pot on both of the longer lines, if nothing else, it would hopefully keep some carp occupied! 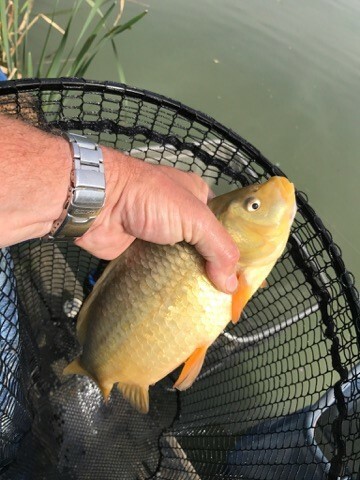 First put in by the reeds, the float buried after a couple of minutes and for once I didn’t miss the first bite, straight away I knew it wasn’t a carp and a 8oz tench got me off the mark. Next put in I had a 2lb ghostie/koi carp and I hoped they hadn’t moved in already! Thankfully they hadn’t and next chuck I had a 12oz skimmer and then a similar sized crucian and I was in heaven! 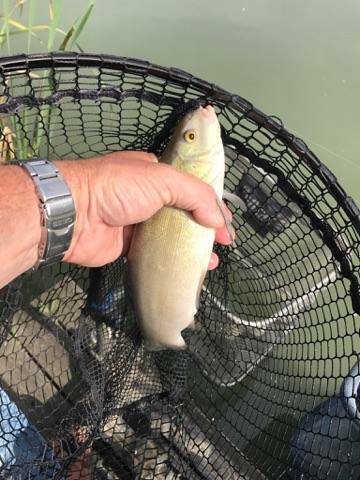 A nice little tench first put in….. Followed by a nice skimmer…..
To be honest, I had almost the perfect first hour, it was a bite a chuck and although I missed a few, I didn’t bump any and had one tench, three crucians and six skimmers for around 8lb (plus two nuisance carp) and really thought at this stage I was on for a big weight. It looked like Roger was getting a few and the Tart was landing plenty of carp. As the second hour started my bites stopped but I wasn’t too worried as I’d been dripping some micros in on the other two lines every time I shipped out. I went in on the right hand top two line and the float just sat there!, it eventually went under but a small carp wasn’t what I’d hoped for. If the first hour had been perfect, the second hour was the complete opposite with only carp and a couple of blades to show for my efforts, I did have a couple of small fish come off but after catching 8lb in the first sixty minutes, I was up to 8lb 2oz after two hours! I had another go by the reeds and had a carp but also lost what felt like a decent skimmer but that was it and I couldn’t believe I’d gone from bagging to struggling. I went out on the top two plus one line and had more carp and lost a couple of small fish shipping back but then I finally had another decent skimmer, no more followed I tried top two to my right again and this time had a nice crucian and another tench so as the half way point approached, I probably had 10lb of silvers and if I could keep putting the odd better silver in the net, a decent result was still on the cards. Roger shouted up to ask how I was doing and said he was getting odd fish but it didn’t sound like he was bagging either. The Tart was still catching carp well and even from a distance I could see that smug look on his chops! Going into the second half of the match, the reed line seemed devoid of silvers and there were carp knocking the reeds about, every time I tried the top two line on the right, a carp would be the result and it was pretty much the same story at two plus one, I was starting to hook some big carp as well, I had one submarine that I thought I had beaten but it came up by my keepnets, shook his head and snapped the hooklength like cotton, another went under the nets with the same result and it was a good job I’d tied a load of hooklengths up on Saturday! 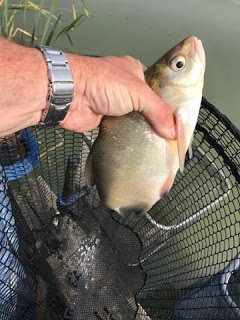 Roger started to catch some big skimmers that were leaping out of the water all over the place whereas all I could catch was the very occasional blade and the inevitable, aggravating carp! The all out was shouted and I was gutted that after such a brilliant start, I’d just fizzled out, Roger came up and said he’d started catching some big skimmers on paste in the second half of the match and might have a bit more than he’d had on Friday so it was odds on that he was going to make it two wins out of two. The weigh in started with the Tart who’d done well again and weighed 114lb 14oz, I was praying somebody would beat him as he would be unbearable if he won two days on the trot and I was seriously thinking I might have to chuck my phone in the pond to avoid the tsunami of gloating texts I would receive! 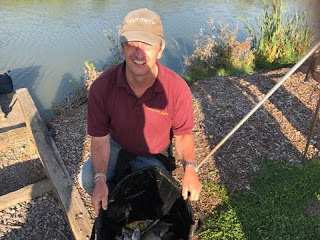 Glen had also done well and weighed 95lb 6oz and then we headed down to weigh the others in, as we got to Simon, Jeff and Rob arrived with Jeff admitting to 6-7lb of silvers and Rob said he had around 13lb and I knew I didn’t have that. 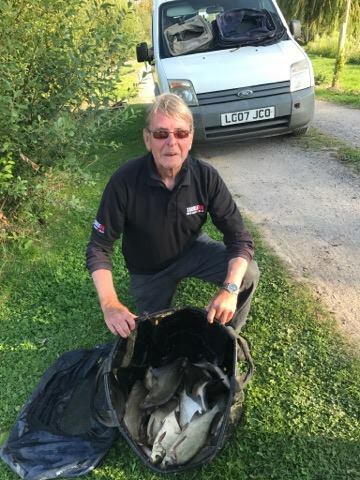 Simon had three nets of carp and after lots of weighing in and adding up where Dave Bull had to take his shoes and socks off, his total was read out at 198lb 6oz, a brilliant weight mate. 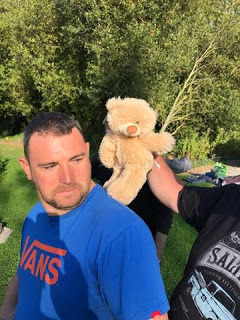 Jeff weighed 8lb 12oz of silvers and then Rob had a nice net of skimmers to weigh 16lb 14oz, Mark Leahy was next and also had three nets of carp, off came Dave’s shoes and socks again (and he even had a little help from Ted!) before Mark’s total was read out as 144lb 1oz (and saved my phone from a watery grave!). Dave even had some help adding up the weights from Ted! 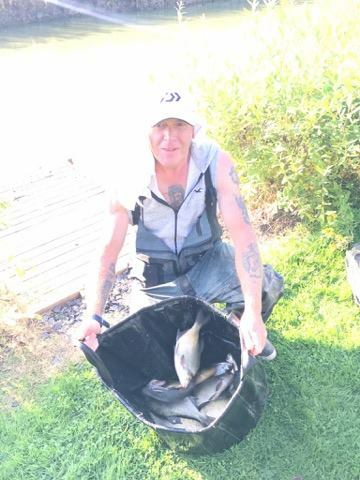 Then it was my turn and my silvers went 12lb 4oz which was a bit more than I thought but only enough to take a pound off Jeff, then we got to Roger and he had a lovely net of skimmers to win with 29lb 15oz, that’s nearly 60lb in two matches, awesome mate! Back at the results and Simon won the carp and also the golden peg which meant he took home an extra £8 (it went on Sunday as well!) with Mark in second and Roger and Rob were first and second in the silvers. As both me and the Tart were third, the side bet was quits and my phone is safe for another week! So a disappointing couple of days for me, I wasn’t far off yesterday but today I’ve messed up a good peg, talking to a few people I think I should have fed more which sort of doesn’t feel right if you’re trying to avoid carp but to be honest after that first hour, what did I have to lose? I could have tried it on one line, I’m back again next week and I think it’s a rover on all ponds so I’ll have another go then.